by Seriously Star.In The Coach.3 Comments on Whose Wedding Is It? I’ve been in a couple of weddings in my day and each of them had one focus…the Bride and Groom. No complaining about the dresses…to the bride (just be honest, you did it) no asking for sitters to be provided for the reception, and no asking to add to the guest list! To be clear, our wedding party, planner, photographer, my dress goddesses, hair stylist, makeup artist, and all of our vendors were all beyond accommodating which made our day AMAZING and stress-free. 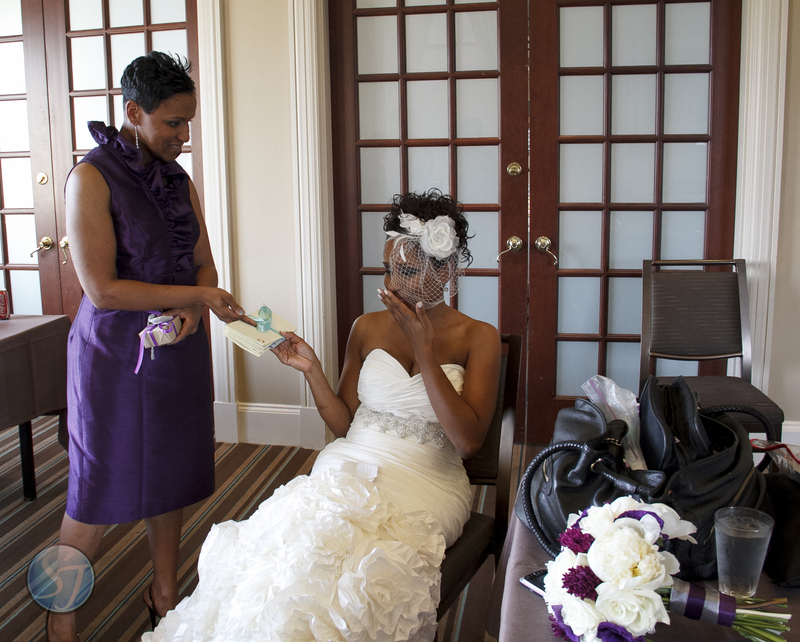 I was so relaxed on our wedding day, you would have thought I spent the entire day at the spa. When actually, I had my forgotten my veil and had a slight wardrobe issue! But, because I picked the right women to stand beside me, my girls fixed it without so much as a second thought. So, it drives me crazy when I hear stories of brides (and grooms) being put through the paces by the very people they have asked to stand with them on the most important day of their lives. Ridiculous. On our wedding day three short months ago, my Magnificent Bridesmaids (MB) told me they had something to give me. Now, the way they surrounded me (flanking me from both sides) made me think for one tiny second they were planning to ‘take me out’. Please don’t ask me why I thought this, I know they wouldn’t have spent hours in hair and makeup to let it all go to waste on a mug shot! But, something happens to you when you are planning a wedding (we had an amazing wedding planner ) and I’m not talking Bridezilla antics. You just have a general sense of craziness all the time about a month before your wedding day. My Maid of Honor’s mother gave me one of her beautifully embroidered handkerchiefs from India. My Something Old. I started to cry…a Mama gift. A few weeks prior to the wedding, my favorite blue box retailer sent a gift to the house. Thinking it was a wedding day gift from the Coach, I put it with our other gifts. A few days past and I asked him if he had something sent to the house from said blue box retailer he said no. Curious as to who would have sent the gift, I opened the box to find a “charming” gift from my MBs. My Matron of Honor let me borrow the bracelet her father gave her mother on their wedding day that she also wore on HER wedding day. Now, here is possibly the best one…My Something Blue. Most everyone knows my mom passed away in December 2008. To say that she was profoundly missed on the most important day of my life is obviously an understatement. It was always our plan to spend the final moments before the ceremony alone, together. So, when I realized I was alone and unable to get into my dress, minutes before heading to the ceremony, I couldn’t have missed her more. Luckily, our photographer was there to help me and she saved the day. Each one of my mom’s sisters (5 of them) wrote me a letter as did each of my MBs on blue paper, tucked into pretty envelopes. I couldn’t read the letters at that time because I was already crying…remember? But when I did (of course I cried), they were filled with love, support, and humor; each one a personification of our individual relationship. This pic was snapped by one of my bridesmaids. A huge THANK YOU to the Coach for without him, there would be no happily married chick, our wedding planner, our entire wedding party, my Aunties, and especially my Magnificent Bridesmaids. You made our wedding experience the best eva! This picture is one from our photographer. Seriously. I am in a faculty in-service, secretly reading this. And now I am choked up. This is the sweetest gift. Previous Previous post: That Just Happened!